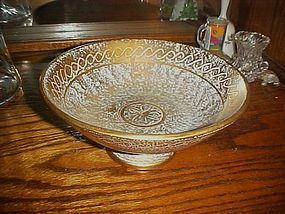 Vintage Stangl Antique gold #4028 compote bowl 8 3/4"
Stangl traditional gold swirl antique gold fruit bowl. Bowl is 8 3/4" wide at the top and stands on a pedestal. Measures 3 7/8" in height. well marked on the bottom and is in PERFECT condition with no chips or cracks. Lovely addition to your Stangl collection. 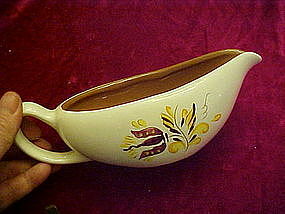 A nice gravy boat in the Provincial pattern by Stangl pottery, Trenton New Jersey. Perfect condition with no chips or cracks. A great completor piece to your vintage set of dishes.